EViacam Download With this free pc program called eViacam , dedicated exclusively to people with reduced mobility, it allows the handling of the mouse pointer with the movements of the head. When installing it is necessary to make some small configurations to allow its use correctly and in a personalized way by the user. With eViacam it is intended that people with reduced mobility have access to the current operating systems, which does not come with built-in utilities to be used by them. 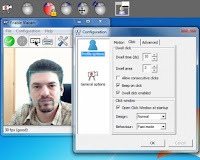 It is about moving the mouse with the head movements that are captured through the webcam of your pc or laptop. At first, the program will have to define the detection area and press the green button. If you leave your head still the program will think you are double-clicking with the mouse, and if you move it, the mouse pointer will follow the path described by the movement of your head. The free program you were waiting for.